Determining the moisture content (MC) in wood, air, or concrete is not like measuring the length of a nail–it is not a truly static trait. 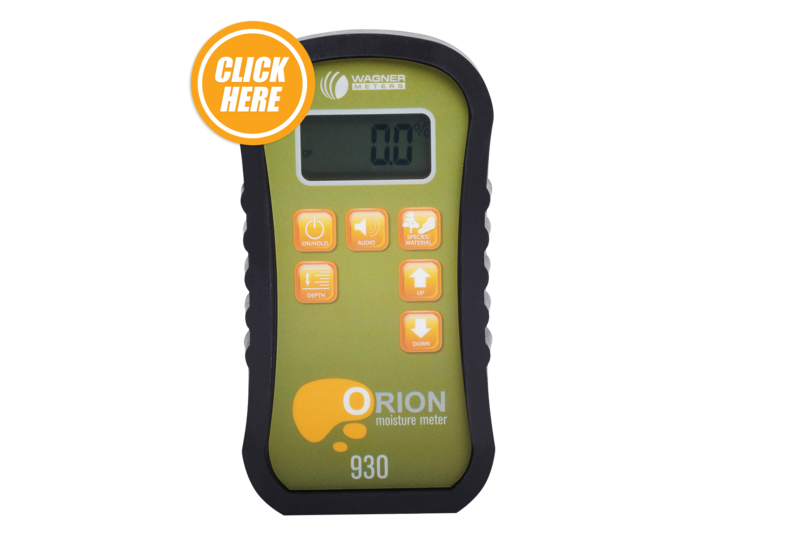 Moisture content can change anytime in any hygroscopic material (even sealed wood floors!). The changes might be small enough to go unnoticed–your bookshelf seems pretty stable, right? Or, they might be large enough to cause some real problems. Stuck doors, buckled floorboards, and split wood stock all happen because wood is capable of change–and it all has to do with moisture. Relative Humidity (RH) is generally expressed as a ratio of the water vapor density (how much water vapor is in each unit) to the saturation water vapor density (the point at which the rate of evaporation equals the rate of condensation). In everyday use, Relative Humidity refers to how much water vapor is in the air at a given place and temperature. Relative humidity is the main source of moisture for cut lumber or finished wood products. (The other, of course, is direct water that may come from a leaking appliance, flooding, standing water, or another source.) When talking about wood MC and RH, there is a definite connection between the two. What is important to know is that when talking about wood MC, the mass of the water vapor in the air creates pressure that is always looking to find a balance (or equilibrium) with its surroundings. In the building and construction industry, it is important to remember some basic information about RH. With wood, RH is generally spoken of as an ambient (or environmental) quality–water vapor in the air around a stack of lumber or an unfinished floor. The water vapor inside the wood is called MC. If you run into the terms RH testing, these generally refer to a test method for concrete that measures the amount of internal moisture or water still present inside a concrete slab. For practical purposes, wood moisture content is the weight of water vapor in a piece of lumber expressed as a percentage of its oven-dry weight (an approximate constant determined by oven drying a sample of the species at a specific temperature for a specific time). Let’s back up a step. When a living tree is cut down, it’s considered “green” wood. It holds all the moisture of the living tree. If left to air-dry, the moisture of the tree will eventually dissipate into the surrounding air and not be replaced by groundwater that the roots would normally supply. This can be a slow process, so lumber mills use large kilns to remove much of the extra moisture from the wood in a controlled environment so that it can be milled to dimensions reliable for building, woodworking, and creating wood products like wood flooring–and they can do so with a minimum of damage (warping, twisting, splitting, or shrinking). Some moisture is still necessary, but removing excess moisture increases the overall stability and strength of the wood. However, putting wood through the drying process (either air-drying or kiln-drying) does not “fix” its moisture levels. Although we tend to think of wood as being solid, in reality, it is actually a porous material that has a structure of long cells designed to transport moisture and other nutrients from the living tree’s roots to the branches and leaves. When cut and dried, those cellular pathways still stay in place and can readily transport moisture vapor too. Wood is referred to as a hygroscopic material because of its ability to absorb and release moisture. Just like the Relative Humidity of the air around it, wood naturally trends toward finding a moisture balance with its environment. What this means is that if the ambient relative humidity (the amount of water in the air around the wood) is higher than the current moisture content of the wood, the wood will absorb some of that water vapor until the level inside the wood is at the same level as the RH of the air. If the surrounding air is considerably drier (has less water vapor) than the wood, the water vapor will move from the wood into the surrounding air. The rate of this exchange may mean the difference between a serious flaw in the wood and a small adjustment in the final dimensions. Evidence of such flaws can be a cracked floor board or one that shrinks slightly after being installed and leaves a gap between boards. So how can you ensure harmony between RH and MC? Allow time for gradual acclimation when wood is moved to a new job site or location, particularly with exotic woods or woods that originated in markedly different climates. Or, if you have your own shop kiln for drying wood, set it for moderate changes over an extended schedule. 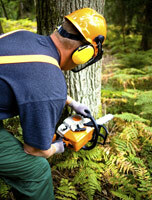 Monitor the changes with an accurate wood moisture meter. Wood moisture meters from Wagner Meters provide easy, accurate, damage-free moisture measurement that lets you quickly determine MC of wood. They also have the unique advantage of not being skewed by surface moisture. When RH is high and temperatures are cooler, a thin layer of condensation can form on the wood’s surface. Wagner’s IntelliSenseTM Technology reads past that moisture layer to provide a true picture of the wood’s internal MC. Wood moisture meters (or a multi-material moisture meter like a building inspection meter) can also be effective tools for determining unseen moisture-related problems in wood floors or other site materials where a change in MC could mean a water intrusion is in contact with the wood itself. When RH and MC are in balance, your wood will perform at its best and retain its strength and beauty for years to come. Wood moisture meters from Wagner Meters provide a simple and effective way to determine when wood has reached a point of equilibrium with the RH of its environment.